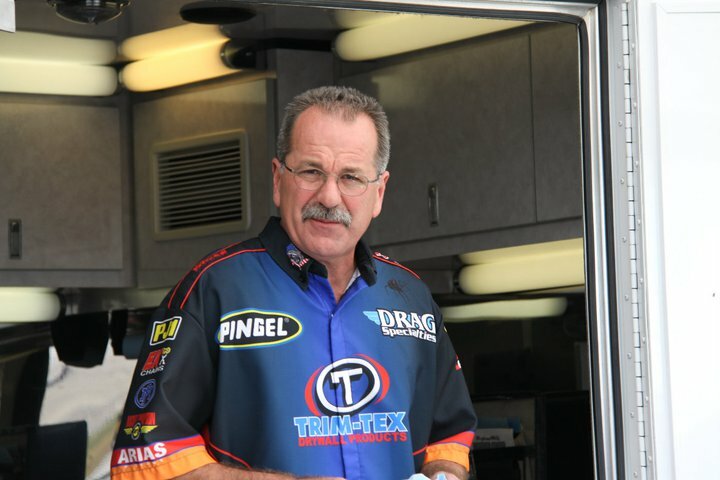 In his 32 years of racing, Top Fuel legend Larry “Spiderman” McBride had never experienced a season quite like the 2010 campaign. After battling an elusive mechanical problem on the motorcycle for 14 months, which was believed to be a attributed to a bad drum of nitro, the ten-time Top Fuel champion was faced with a much greater dilemma. In late-June the series McBride devoted much of his career to, AMA Dragbike, formerly AMA Prostar, unceremoniously went out of business. Always the optimist, McBride rejected the notion that his days of competing on a national level were over. “I knew the sport wasn’t dead and I refused to quit believing. I knew someone would come along and put a race together. I just didn’t know how soon it would happen,” McBride said. McBride’s prophecy would come true much quicker than he expected. Jay Regan of Murdoch Racing Enterprises (MRE) and eight other motorcycle drag racing businesses banded together to host the Manufacturers Cup in November in Valdosta, Ga. – the site where AMA Dragbike had planned to run its final race of the year. The Manufacturers Cup proved to be a great success. Over 100 pro races showed up and Top Fuel enjoyed its healthiest turnout in over six years with eight competitors. The Spiderman certainly noticed the higher level of competition. For the first time in over a decade, McBride qualified in the bottom half of the ladder, No. 5 at 6.71, after failing to get down the race track cleanly on Friday or Saturday. 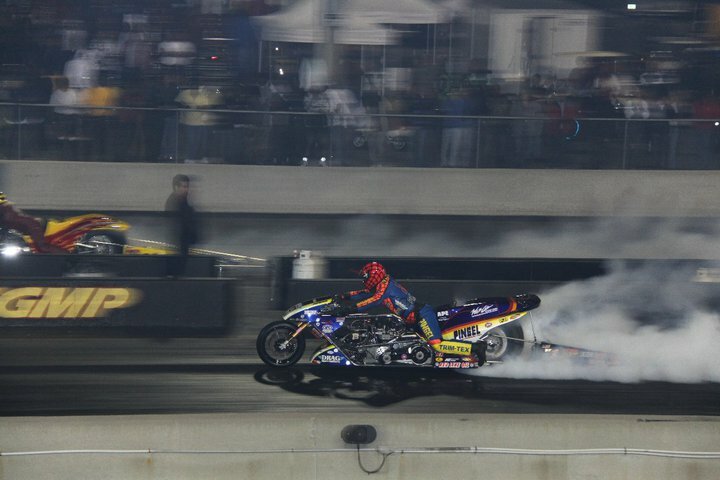 McBride warming the tire on his 1,500-plus horsepower motorcycle. On Sunday McBride engineered one of the greatest comeback stories of his career. The Spiderman overcame adversity to advance to the final round alongside the world’s quickest Harley-Davidson of Tommy Grimes, fresh off his 6.14 earlier in the event. McBride improved to a stellar 5.83, low elapsed time of the meet, at 232 mph to defeat the 8.78 at 102 mph of Grimes. Now McBride focuses his attention to 2011. Recently the Manufacturers Cup committee announced the dates for two more events in Valdosta, April 8-11 and Nov. 11-13. 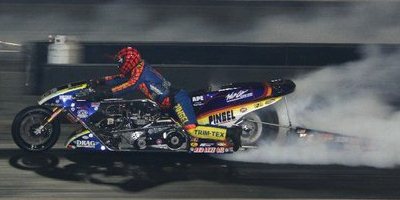 The Spiderman believes another full field in Top Fuel is a very likely possibility. “I think you will see a lot of Harleys coming to race with us. The weather should be excellent at both Cup races. People will come to go fast,” McBride said. McBride also said the Cup committee recognizes the importance of an entertaining field of Top Fuel and is working on incentives for nitro racers to attend. McBride’s all-time best run came in Valdosta, Ga., in Nov. 2008 at 5.746. McBride welcomes the challenges the 2011 season will bring and the 52-year-old world record holder has no plans of calling it a career anytime soon. 2010 what a year of ups and downs for Larry heres to a record breaking 2011..Good luck ride safe.